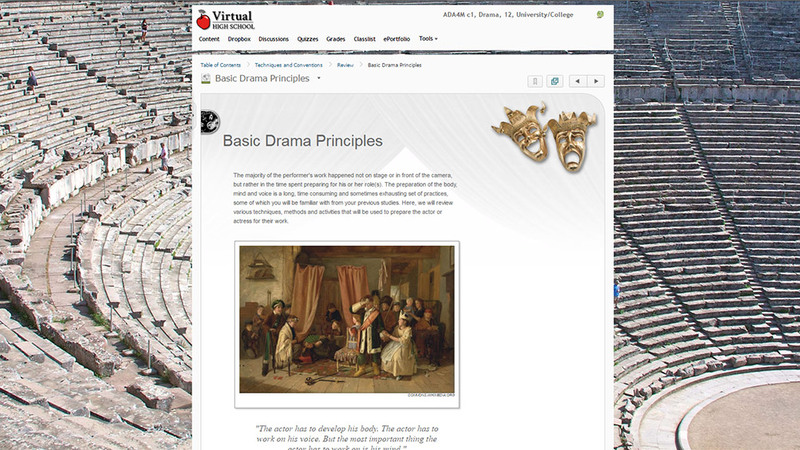 In this unit, students will examine the basic principles of preparing for the study of drama. This will include the various expectations of a thorough warm up and examining the purpose and importance of reviewing safe and ethical practices throughout their studies. Next, they will discuss the process of submitting work throughout the coming units. It should be noted that the first portion of this course is more content heavy, and that the last two units are performance-driven, so students may have to revisit the procedures outlined in this unit throughout the course. Finally, students will review the standard plot-structure and the conventions of storytelling as they will explore many scripts, excerpts and character profiles throughout this course. In this unit, students will learn skills that are useful in drama such as, leadership, confidence, originality, and creativity, as well as certain skills that will help make you a well-rounded performer. Students will practice these skills through creating a promotional video where they persuade their audience to make a change about something. Students will learn the ways in which studying drama can provide valuable skills and lessons outside of the school setting. Finally, students will explore the purpose of drama, drama in the classroom, and influential figures in art and theatre. As a final summative assignment in this unit, students will create their own performance art piece. In this unit, we will work through various aspects of the creation of the character. We will start by looking at the definition of character and how character plays an important part in the storytelling which is so integral to drama. Next, we will examine various character types found in both Canadian plays and international plays, working to examine common themes, types and elements which connect the creation of these “heroes”. Then we will break into the various theories, techniques and models which have been developed to help actors and actresses ‘become’ the character which are so integral to the drama piece. You will be asked to reflect on, critique, analyse and create characters in various genres and styles, always working through the creative processes listed in the previous units. In this unit, students will explore the history of theatre beginning with Greek theatre and moving into Early Christian Theatre, Italian renaissance, and English Renaissance theatre. Students will study the performance of a soliloquy using the Shakespearean Text, Macbeth. Finally, students will explore modern theatre including technological advancements, absurdism, and acting without words. Students will examine two different pieces of theatre, The Threepenny Opera by Bertoldt Brecht, and Rent by Jonathan Larson. In this unit, students will explore how culture is integrated into the arts. Students will have the choice of studying one of two plays by Tomson Highway - The Rez Sisters or Dry Lips Oughta Move to Kapuskasing. Students will also choose a play which they will read and complete various tasks on. The two plays to choose from are White Biting Dog by Judith Thompson, or Generations by Sharon Pollock. This is a two-part project worth 15% of the final grade. Part A requires that students perform three monologues. One will be a Shakespeare classical piece, another will be from a modern Canadian playwright, and the third will be a self-written monologue based on an archetypal character. For Part B, students have the option of choosing 1 of 6 written assignments that cover a wide variety of topics. A3 Presentation Techniques and Technologies: use a variety of presentation techniques and technological tools to enhance the impact of drama works and communicate for specific audiences and purposes. B3 Connections Beyond the Classroom: identify knowledge and skills they have acquired through drama activities, and demonstrate an understanding of ways in which they can apply this learning in personal, social, and career contexts. C3 Responsible Practices: demonstrate an understanding of safe, ethical, and responsible personal and interpersonal practices in drama activities. Education in the arts involves students intellectually, emotionally, socially, and physically stimulating a wide variety of learning styles and increasing a student’s learning potential. Hands-on materials and activities challenge students to move from the concrete to the abstract. The arts can be enjoyable and fulfilling, but they are also intellectually rigorous disciplines involving the use of complex symbols to communicate. Arts education provides a way of perceiving, interpreting, organizing, and questioning. Through the arts, we can record, celebrate, and pass on to future generations the personal and collective stories, values, and traditions that make us unique as Canadians. The arts broaden young minds and exalt our spirits; they help us understand what it is that makes us human by validating our commonalities and celebrating our differences – which is so important in a multicultural society like Canada. Artistic expression involves clarifying and restructuring personal experience. It engages students in perception, production, and reflection. Learning in, through, and about the arts involves using the mind, body, heart, and soul to achieve intellectual, social, emotional, and spiritual well-being.